Easter Sunday will be here in just a few weeks and we’re gearing up for a great day of celebration together. Not only is Easter a special time of the year for those of us who are committed followers of Jesus, it’s also a unique time of the year when people who aren’t connected to a local church are interested and looking for a service to attend with their family. According to the Pew Research Center, more Americans search online for “church” around Easter than at any other time of the year. Some of those people are your friends and family, your neighbors and co-workers. So, our challenge to you is to invite a few people to Easter at MCC this year. Think of a family or two that you’re pretty sure doesn’t have a church home and extend an invitation to them to join us for one of our identical Easter services at 9:00am and 10:30am on April 21st. According to Dr. Thom Rainer in his book The Unchurched Next Door, 82% of unchurched people are at least somewhat likely to attend church if invited but only 2% of church members will invite an unchurched person to church in a given year. Let’s not let that statistic be true about our church! Let’s partner together to extend the message of Easter to the people around us. In order to help you do that, we’ve pre-printed Easter invitations for you to take home with you. 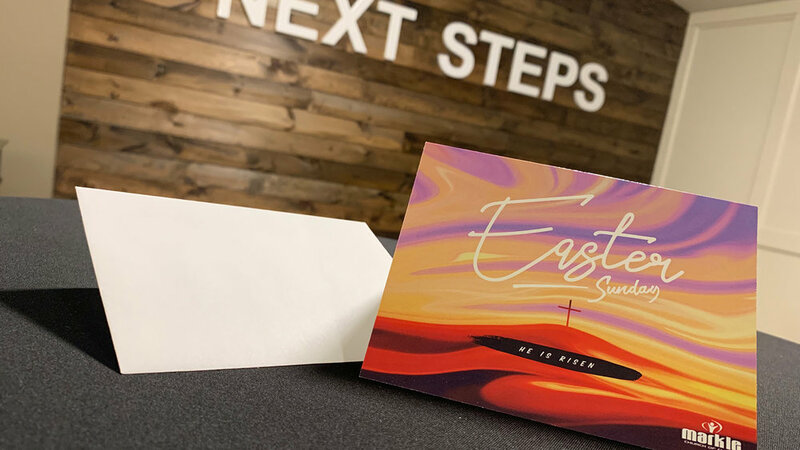 These invitations have information about our church and our Easter services printed on the outside and they’re blank on the inside for you to write a hand-written message to the people God leads you to invite. You can pick up as many as you’d like at the Next Steps area in the lobby this Sunday.